If you are already in any social media platform and are actively posting at least once a day, I am certain that you can pull this off. Don’t get stuck with just one type of social media content! There are many different types of content that you can create to get the audience engaged with your brand. This social media content challenge starts on March 2. Schedule, calendar and guidelines are all below. This is for social businesses only, not personal social media accounts. Notify me [Ruby] if you would like to join the #30DaysofSoMe Challenge. You may email me at ruby[@]socialsuccessmarketing.com. You need at least two social media accounts to participate. One must be GooglePlus. You will receive an invitation to the Google+ community once I hear from you. The group is exclusive only to participants. Share in the GooglePlus community the link to the social media content that you created for the day. Saturdays and Sundays are optional. 🙂 I am a firm believer of resting the mind to stay healthy and productive. Not a requirement but I highly recommend participants to go and visit links shared by others. That is, as long as links do not have registration wall (requiring email address and other info). I believe that will help build community. 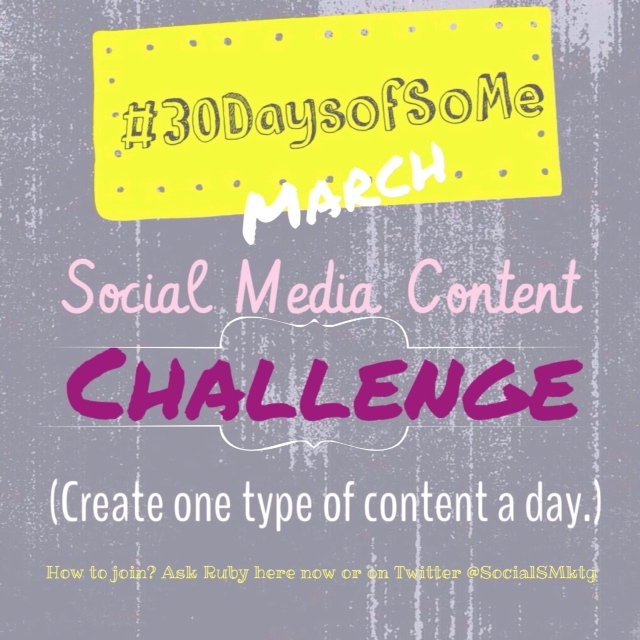 When posting in other platforms, please tag the content with this hashtag: #30DaysofSoMe. Inspiration about this social media content challenge is from ConstantContact. Just click the link to their site for more info. Join us!